There is a longstanding debate amongst the pet parents about which one’s a better type of flea and tick treatment– Oral or Topical. Some of them are more inclined towards topical while some are strictly advocating Oral treatments and there are some more people who say that they go with the type of treatment that suits their pets. And because, of these varied opinions and consumer choices, big brands are also constantly re-inventing and trying to come up with both oral and topical flea and tick preventives to increase their horizon in the market. One of those giant brands is the Merck Group. Merck Group has already changed the game by successfully introducing 3 months flea pills called Bravecto in the market. 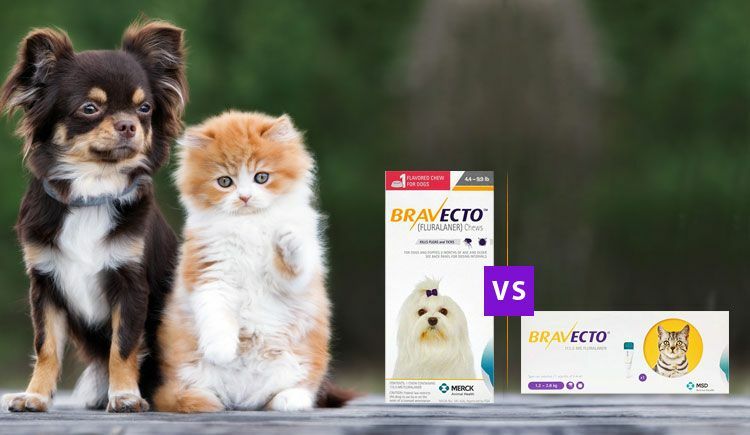 Bravecto initially was launched as a chewable for dogs in 2014 but to broaden its market reach, Merck also launched Bravecto spot –on for dogs and cats in 2016. Now, after the launch of bravecto spot-on, there are different opinions about the efficacy of bravecto chewable or spot-on because one is oral and the other is a topical form of treatment. So, just to add to the ongoing debate here is detailed information about the differences and similarities between Bravecto chewable and Bravecto spot-on. 8 Safe for pregnant and lactating dogs Safety of bravecto spot-on for cats on pregnant and lactating cats has not been determined yet. 10 Slightly costlier as compared to spot-ons The price of spot-on is less than the oral treatment. 14 Should be given to puppies of age 6 months or more and weighing at least 4.4 lbs Can be given to cats of age 6 months or more and weighing atleast 2.6 lbs. For dogs, it’s the same as the chews. 15 Be very careful if your dog has a history of epilepsy or muscle tremors or seizures or ataxia Just as in the case of oral treatment even in spot-ons the cautions are same. You should contact your vet before administering the treatment if your dog or cat has a history of neurological abnormalities. Well, as you can see both Bravecto spot-on and Bravecto chewable are equally competent and easy to use. You can either go with an oral or topical form of the treatment depending upon your choice. It is also advised to check whether the oral treatment is more suitable or the topical one because it can vary from one pet to another. The best part about the Merck’s bravecto is that both oral and topical types of flea and tick treatments give your pet 3-month protection and relieve you from the hassle of administering the dosage every month. Is Bravecto,Nexgard, Simparica and Credelio safe or Not?